What’s this? No sweet stuff? I thought I’d try to write about the food that I cook the other 6 days a week. After all, a girl’s got to keep things in balance you know. People are always asking me how I stay healthy and fit while I cook the sweet treats on this blog. The truth is my regular diet runs virtually fat-free and as close to all-natural whole grains, meats, dairy and produce as possible. Sometimes it feels like having a split personality, eating this way and splurging so decadently when it comes to baking. But… it strikes a very happy balance that allows me to enjoy the good stuff without suffering any consequences. It works. This recipe is a combination of my favorite Tex-Mex ingredients with something completely new – black eyed peas. If you haven’t tried them before, I highly recommend doing so! They are quite nutritious and very satisfying. When eating lean and green I am always trying to maximize satiety and food volume and minimize fats and calories. This dish is so flavorful and filling, it really hits the spot. It only takes about 20 minutes to prepare and makes enough for 2 meals. Turn oven broiler to high. 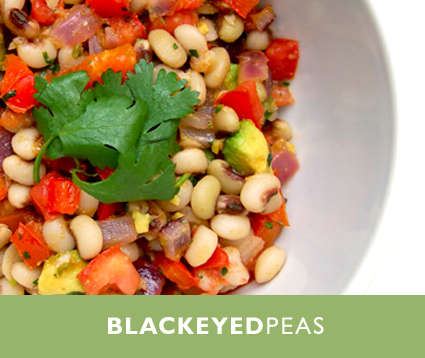 While heating, boil the black eyed peas in lightly-salted water until fork tender and drain. Broil the onion and bell pepper for 4-6 minutes. While things are cooking, combine the dressing ingredients. When the onions and bell pepper are done cooking, let them cool down just a bit. Finish by combining all ingredients and the dressing in a bowl and toss gently. You can serve this salad warm or at room temperature. If you want to boost the satiety of this meal, add some heat. Spicy dishes tend to make you feel more full and crave fewer foods afterwards.